Practicing medicine is a demanding and rewarding life. When dealing with the day-to-day issues of running a practice or discussing health policy or finances, it is easy to become cynical or discouraged. My recent experience in speaking to new medical students at two white coat ceremonies caused me to reflect on our profession and remember its rich rewards. When I began medical school 40 years ago, there was no formal approach to teaching professionalism. You were expected to emulate the observed behaviors and attitudes of the best physicians. The formal teaching of professionalism began 15 or more years ago, and has been a welcome addition to the educational process. As I was preparing for these speeches, I thought back to my own career development, and about how much the science of medicine has changed while core principles of professionalism have not. Patient stories are a powerful medium to teach core principles and tap into the reasons we all chose this profession. Three key messages illustrated by a few stories have particular meaning for me. I'm often amazed at how much we don't know about how the human body works and how disease operates, and how our paradigms change over time as we learn more and more. Dan was an 84-year-old attorney with pancreatic cancer who underwent a Whipple procedure and was disease-free for seven years, only to have a recurrence with multiple metastases. He had a 5% five-year predicted survival rate at the time of his initial surgery. He lived nine years. Jerry was a 15-year-old with measles encephalitis who was profoundly impaired cognitively and required a tracheostomy and feeding tube. When he didn't show improvement after 13 weeks of care, it was suggested to his family that he be moved to a custodial care facility. His mother said, “I won't do that. I know he's there; I can look into his eyes and see him respond.” We thought she was unrealistic and perhaps even foolish. I rotated off the teaching service. A year later, Jerry came to the office for a foot blister that occurred at a basketball camp. He was a normal 17-year-old. We all have stories of patients who defied expectations. When I talk with a patient with a newly diagnosed fatal disease, I have often been asked, “How long do I have?” I answer that I don't know, but can share an average. I remind patients that averages are made up of high numbers and low numbers, and that each individual is different. Despite all our knowledge, we often cannot explain what we see happen to our patients. We have much to learn. Stephen was a 78-year-old man whom I saw for 10 years after he retired and moved to my community. He was a well-known historian, and we spent many hours over the years talking about his area of expertise, the Civil War. We also talked about his end-of-life wishes for no interventions should he suffer an illness severely compromising his ability to continue writing and speaking. He had published several books and continued to be in demand as a speaker. Then he had an unexpected severe cerebrovascular accident that left him obtunded with a dense hemiplegia and without speech. I spent time with his wife and son talking about a feeding tube and long-term care, both of which they wished to pursue despite knowing Stephen's stated directive. I advocated for Stephen's wishes that such measures never be put in place. A few days later, the three of us were at his bedside as he quietly died. His wife, Ivy, was holding his hand and we all cried. Twenty-two years later, it seems like yesterday. We all have many stories of patients we cared for and cared about. For most of us, the medicine we learned in medical school has been superseded by new developments and knowledge that have changed how we diagnose and treat many illnesses. Ralph was a highly respected pediatrician and one of my heroes. I first started seeing him when he was 80 and had just retired from practice and teaching. He was always busy with various community boards as well as caring for his ill wife. And he was always reading and learning. I was behind in the office late one afternoon when I entered the exam room only to see an impatient Ralph, now 93 years old, pacing. Telling stories about real patients taps into the values of our profession and helps us understand why we do what we do. In the end, the work is all about the patient, and our patients are indeed real people with all the challenges that life can bring. Ours is a privileged presence. Give me your thoughts. 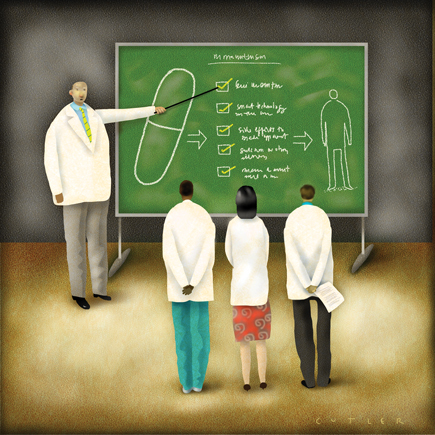 What advice about a life in medicine would you give today's new medical students?